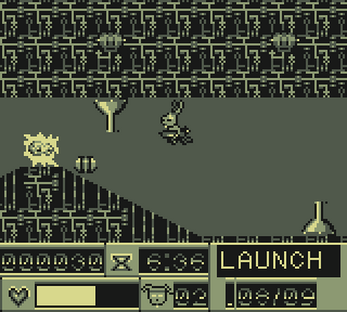 Bun and Gun is a high-speed run-and-gun platformer where you play as Bun E. Bazooka in an attempt to save the Jade Kingdom from the vile clutches of the surprisingly-vampiric turtle Shelltopias Turtatory Von Turtula. 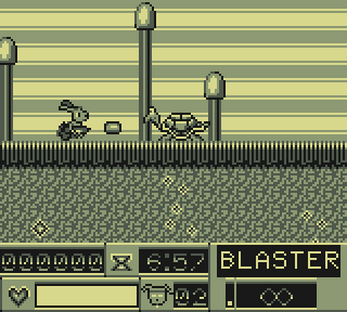 It is also a Gameboy-style demake of Jazz Jackrabbit 1's shareware episode, made for the Demake Jam. Four different difficulty settings, ranging from the mildly-challenging easy mode to the maddeningly difficulty Turbo mode (NOTE: I recommend saving Turbo mode for after you've already beaten the game at least once, it borders on downright unfair otherwise). 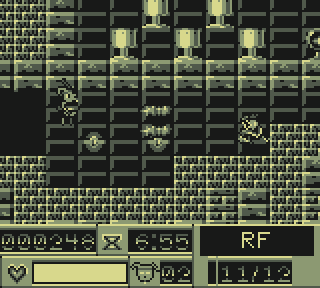 Forgiving lives mechanics: When you run out of lives, you restart at the previous checkpoint and lose all your points instead of losing level progress. This even applies at the highest difficulty settings! Unique ammo mechanics: Ammo regenerates over time, and regenerates faster based on how many fire-rate upgrades you've collected. If you can't find any ammo, just wait, it'll come eventually! However, your ammo is capped by how many Large Ammo pickups you've collected throughout the game, so you still have to be careful not to waste it! A grand finale where you square off against the Vampiric Turtle himself, Shelltopias Turtatory Von Turtula! The boss battle changes significantly based on the difficulty setting you choose. Q: Can I remap the controls? 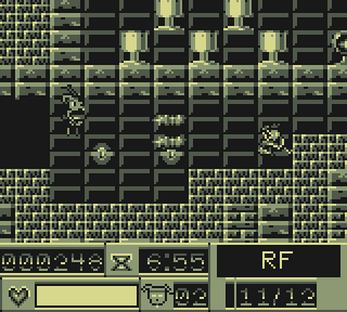 A: Because Jazz Jackrabbit 1 was hard, especially later on and on higher difficulty settings. I'm hoping the effectively unlimited lives and easy mode are enough that most players can at least beat the game. Q: Why is the main villain a vampire turtle? A: Because I thought it'd be an interesting change compared to the original game. A: Please report it ASAP. I don't plan on fixing any bugs until after the Jam ends, but once it's ended, I may fix some of the most important ones. Q: I don't like one of the levels, can you change it? A: Possibly. Let me know which section or sections you don't like, and I'll see what I can do. Q: I don't like the final boss on hard mode! A: Because I didn't think of it and nobody's asked me it yet. Feel free to suggest things to add to this! Make sure to extract the entire ZIP file.